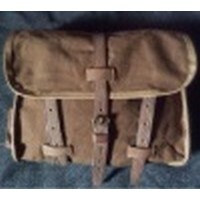 Previous comment was for the haversack, sorry. Braces were a good length accurate shape and a good colour match to the description on Khakee Web. I thought they should be thicker but this reference said US made ones were a bit thinner than UK ones and actually these will probably be more comfortable the way I need to wear them. Seem strong enough anyway. My favourite piece in the order, accurate to the originals, strongly made, will be very useful for my living history role. One negative, easily covered by me with colouring, but can I suggest using all brown or khaki thread instead of the white in places. I just received the items and I am very satisfied about your services and the quality of the material. They are very nice reproductions. Great copy of the scarce equipment. Awesome product, can't praise the quality enough!